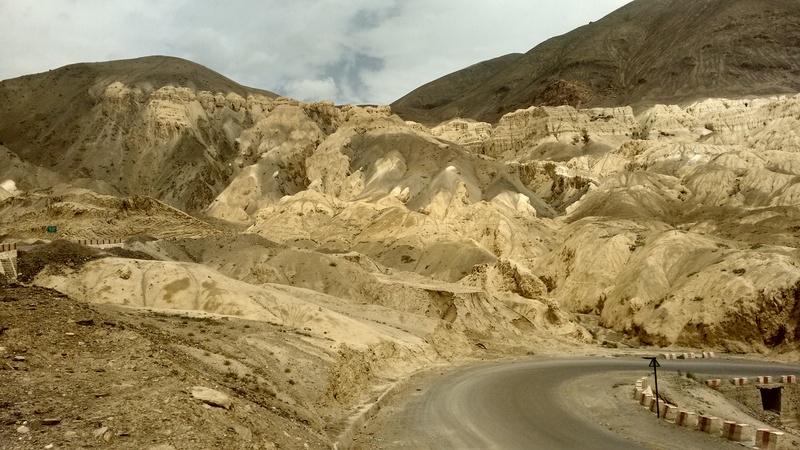 There are loads of attractions in the Ladakh region. Besides the town of Leh and the nearby sights there is Pangong Tso (Tso means lake), Tso Moriri, Nubra valley, Kargil and countless treks. Each of these would require at least an overnight stay. 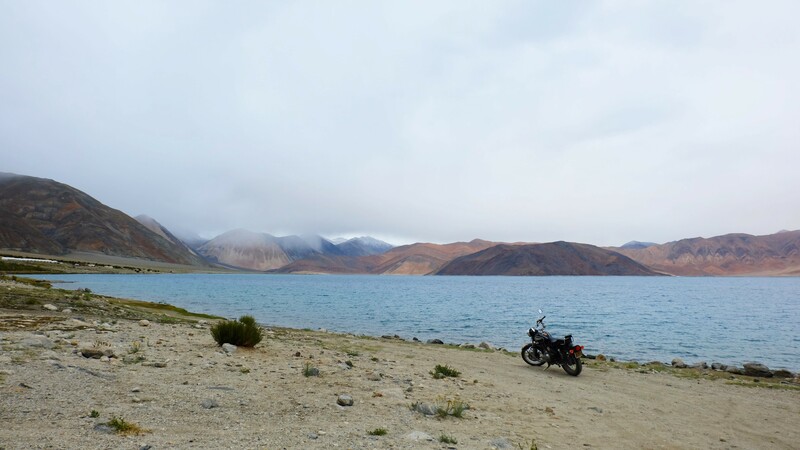 My first excursion outside Leh was to Pangong lake. This lake is situated at 4250mtrs, is 135kms long of which only 25% is in India and the rest is in China. I was joined by 2 of my friends from Pune and another couple from Mumbai with whom we were sharing a cab. We set off on a 5hr drive (which turned into 8hrs). We were excited and chirpy to begin with but got quieter and tired as the day progressed. The roads, though loads better than when I went to the Valley of Flowers (in Uttarakhand), was still bumpy and the high altitude was giving me a headache and making me nauseous. But as with any other drive around Leh, the views were great! Barren mountains with greenery in the valley and ice caped mountains in the background. Or mountains that appear red (due to the soil/minerals perhaps) from one side but when you take a turn looked green from the other side. There were brilliantly funny signs on safe driving (posted by the Indian army) throughout the journey which kept us entertained. Some of my favourite ones were, “If you drive like hell, you’ll get there”, “Driving is risky after whisky”, “Be gently on my curves”, “Don’t be silly on the hilly” and “This is a highway not a runway”. Once at Spangmik, which is one of the villages along the lake, we booked ourselves into a very basic Tibetan homestay, went down to the lake for a few pics before it got dark and returned in time to eat simple but delicious homemade food. The next day i woke up around 5:30 to be by the lake before sunrise as the lake is said to change colours from before sunrise to when the first rays hit the water. 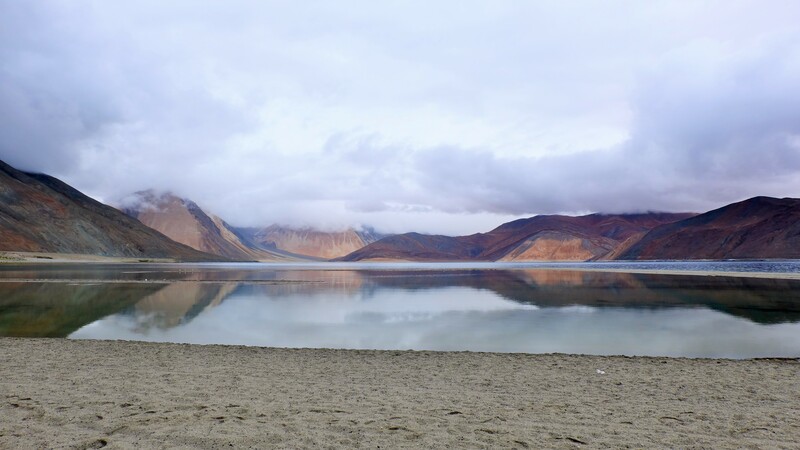 Infact, the lake is famed to have 7 different colours based on the time of the day and how sunny/cloudy it is but only the locals can boast of being witness to this as it is not a very common occurrence. We didn’t get to see that many colours because it was extremely cloudy that day but even then the views were spectacular! The lake was brilliantly blue in some areas and clear in the others which gorgeously reflected the multicoloured mountains. 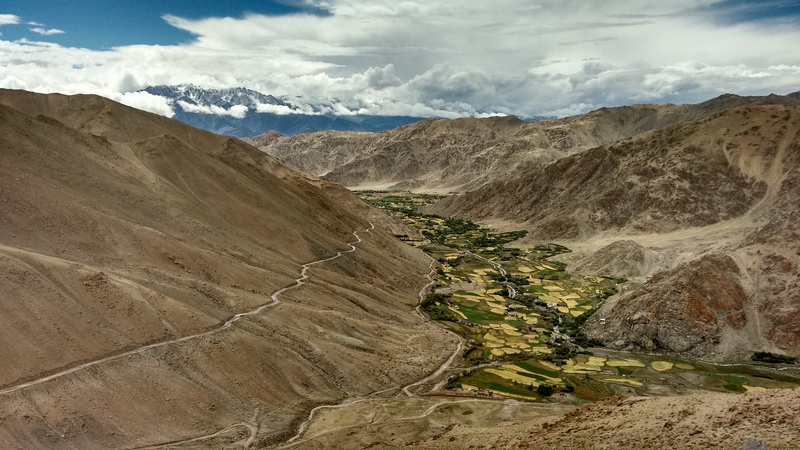 This valley, which lies to the north of Leh, and is accessible via the Khardungla Pass, is also a high altitude dessert. Situated at around 3000mtrs the valley is famed for it’s delicious apricots and for the sand dunes near at Hunder. 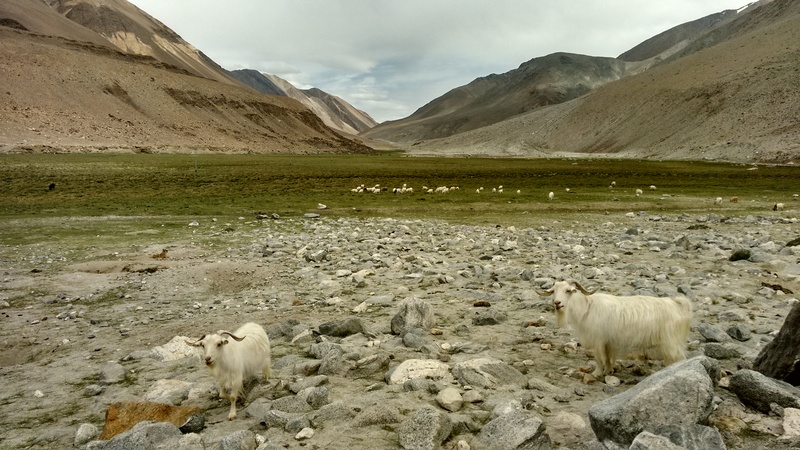 It is formed by the joining of the Shyok and Nubra rivers and has a lot of villages on either side of the valley that the visitors are attracted to. I stuck to Diskit and Hunder which are along the Shyok river. 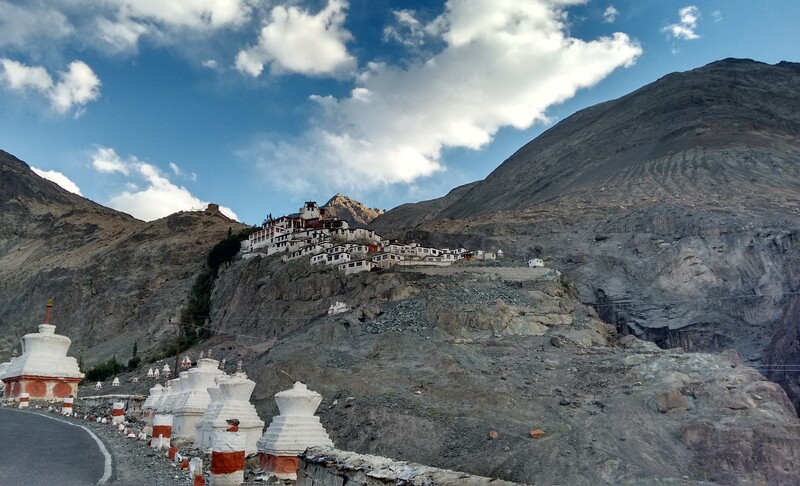 Besides the Diskit Gompa, which was my favourite gompa in Ladakh, there’s not much to do in the village. Hunder on the other hand is where the sand dunes are. These dunes were phenomenal as the sand was bordered by some vegetation and there were pockets of water in the middles of the “dessert”, and all of this surrounded by beautiful mountains. The camel safari was a disappointment as it last not more than 10-12mins. A village on the Leh-Srinagar high way, Lamayuru is known for it’s monastery and for it’s lunar like, beautifully odd, landscape. This can easily be covered on a day trip but i stopped for some pics on the way from Kargil to Leh. Despite having spent 5 weeks in Ladakh there is still so much i haven’t seen and for which i will surely go back one day. 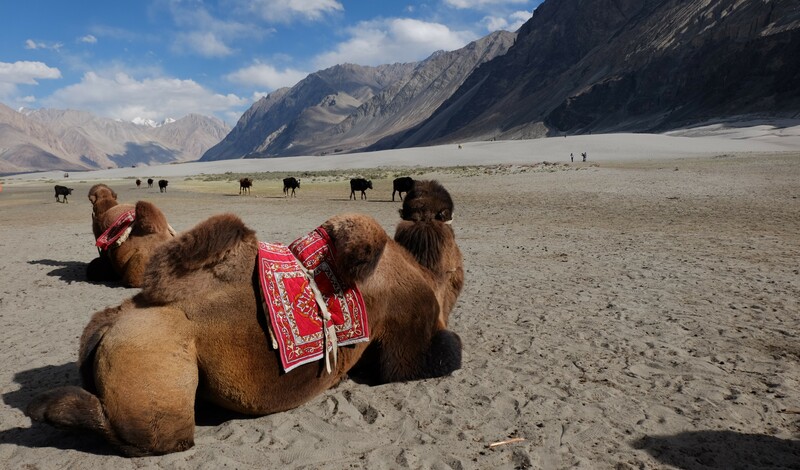 But if you find yourself in the region and have the time then Tso Moriri, the Zanskar region and Turtuk village in Nubra Valley is a must-see. Ladakh was the highlight of my 6 months of backpacking around SE Asia and India and if you are planning to visit this region then I hope that you enjoy it as mush as I did. Next Post A new beginning…or is it? The article is as beautiful as the pics . Simply transferred me to the mountains .